Austro-Italian-French War or the Second War of Independence in Italy "was a war between France and Sardinia on the one side and the Austrian Empire on the other. Before 1861 in Italy, there were several independent states. The northeastern part of Italy was ruled by the Habsburg Austrian Empire. During the war and the subsequent landing of Garibaldi's troops in Sicily were united Kingdom of Sardinia from Lombardy, Tuscany, Romagna, Parma, Modena and the Kingdom of the Two Sicilies. Kingdom of Sardinia (Piedmont), with its capital in Turin included the Principality of Piedmont, the Duchy of Aosta, Genoa, Montferrat, Savoy, County of Nice, as well as the island of Sardinia. It was the largest and most economically developed state in the Apennine peninsula, which played a crucial role in the unification of Italy. 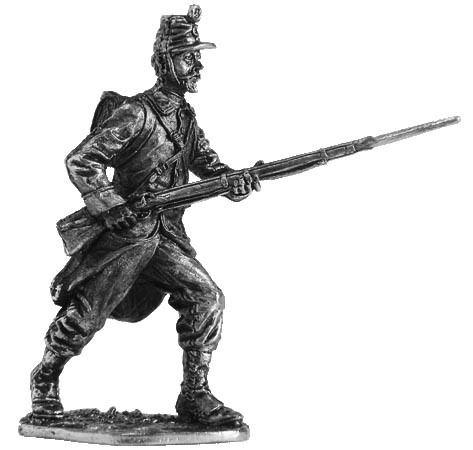 In the mid-19 th century Sardinian line infantry consisted of 2 Guards and 18 army regiments, summarized in 10 brigades of 2 regiments each. Infantryman dressed in a gray coat with white buttonholes and buttons, white trousers and brown leggings with laces. Belt of ammunition - from the white skin. On copper plates belt - a cross made of white metal. On the right side of the wooden water bottle, on the left sword with a brass hilt. Black cartridge scrip hanging on the back of the belt. For knapsack tied a pot and roll out of uniform. Keever Shako in black waterproof cover has a round pompom with company and battalion difference, and number - the number of the regiment. Rifle with fixed bayonet has a white belt running.